Home » » Blog » Uncategorized » California Trip, First Advanced! After Aspen Farms myself and Lauren Plog headed down to California to show at Twin Rivers and Woodside. Twin was a great success and Young Gun finished 4th in OI. Lauren did well with Money Talk’s as well. The plan was to make the big move up to Advanced at Woodside. I chose to head down to Kingsways Farm to work with Hawley Bennett in between the events. She was very helpful and focused on straightness and upper body control over fences. I was really happy to be in California with such a nice group of upbeat and positive people. We headed up to Woodside where Kelsey and Hannah McNamara met us. Needless to say, I was a bit nervous about going Advanced. 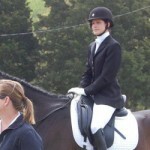 I tried to stay focused and relaxed which really worked in the dressage. We scored a 31, which tied us in 1st! That was a huge surprise as I felt I had a couple mistakes. I couldn’t be happier with our improvement in dressage. 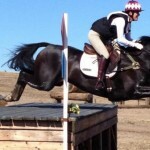 I completely credit Kim Severson for improving our dressage this past spring. I look forward to working with her again this winter and spring back east. Walking the cross country course, I realized that I was well prepared and Max was more than capable to conquer the course. 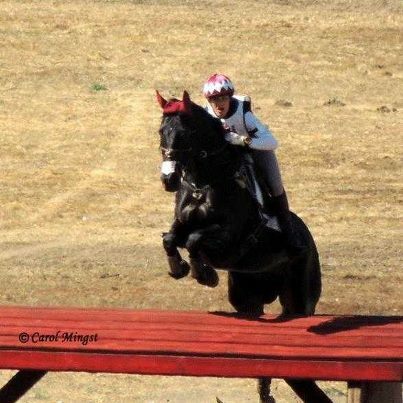 After fence 7, my “left corner menace”, I realized that Max and I were going to do this. Max was so bold and confident…. it was like he was out for a Sunday stroll over 4 foot monster fences! Looking at my clock I thought it was crazy that I was up on the time so much. Double Clear!!! I was stoked. After finishing and finding my mother in tears and getting hugs all around, I looked over at Max and thanked him. That little horse has made my dreams come true. Show Jumping is a weakness of mine and I continue to try to work on it. As I entered the ring it was very important for me to block out everything. Max was great. 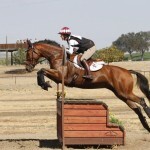 He jumped well and we were smooth and together, however I made a mistake to the last fence. I needed to focus just a bit more and hold my line better. All in all, I left my first Advanced on top of the world. 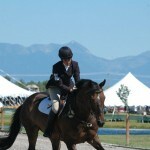 I feel capable and elated to have such a nice horse. I am very excited about the year to come.